Looking to start or augment an art collection? Join celebrated Chicago artists, designers, philanthropists, and fashionistas at DIFFA/Chicago’s highly anticipated Art For Life Chicago, a spectacular juried art exhibition and silent & live auction offering for sale some 60 works by some of the most high-profile names in the contemporary art world. 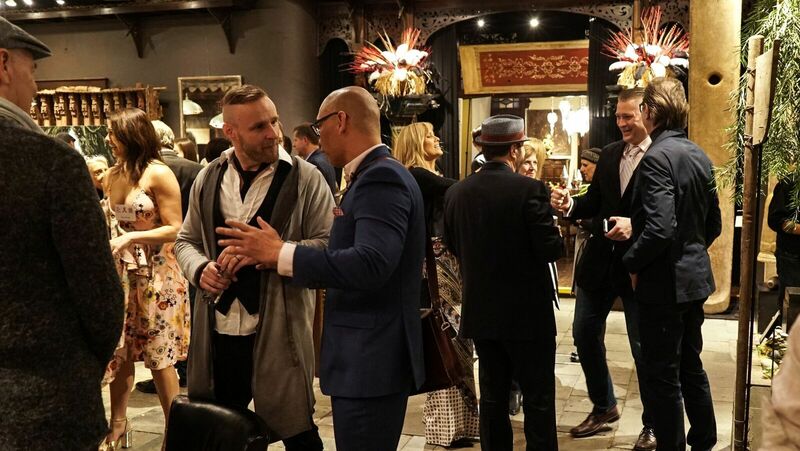 Art For Life Chicago, a high energy evening of bidding, beverages, and bites – not to mention the opportunity to raise vital funds for those in our community most impacted by HIV/AIDS – will be held at Venue West (221 N. Paulina Street, Chicago) on Thursday, October 18, 2018, starting at 6 p.m.The 2nd Annual Art For Life Chicago fundraiser will feature a stunning array of donated works from well-known established professional and emerging artists. Nearly 60 pieces of contemporary art, including painting, photography, sculpture, and other 3D media, will be available for sale via live and silent auctions, ranging in price from $50 to $5,000. Patrons can even start bidding online early starting October 15th at artforlifechicago.org. Exhibiting artists were selected by a jury of nationally-recognized art experts, including Richard Bentham – Smithsonian Institution, Exhibit Designer; Jef Bourgeau – Museum of New Art, Director; Bert Green – Bert Green Fine Art; Jessica Hopkins– Museum of New Art, Chief Curator; Laura-Caroline Johnson – DePaul Art Museum, Collection and Exhibition Manager; Amy King – King Art Collective, Art Consultant/Curator; Aron Packer – Leslie Hindman Auctioneers, Business Development Rep, Fine Art; Derek Roberts – Smithsonian Institution, Design Manager; Jeremy Rothschild – The Chicago Council on Global Affairs, Ambassador; Catherine Shotick – Driehaus Museum, Curator of Collections and Exhibitions; and Doug Van Tress – Golden Triangle, President/Owner. In addition to the live and silent bidding process, one of the highlights at Art For Life Chicago is sure to be the crowd-pleasing “Off the Wall” opportunity for guests to ‘purchase and cut’ a desired piece from a giant art canvas designed by a group of artists to create their own, one-of-a-kind keepsake from the night. Joining Baisch on the Art For Life Chicago committee are Co-Chairs Oliver Aguilar of Gooch Design Studio, Matthew Lew of Matthew Lew Fine Art and Franklin Riley of Fulton Market Gallery. DIFFA/Chicago (Design Industries Foundation Fighting Aids) is a not-for-profit fundraising and grant-making foundation that distributes funds to Chicago area HIV/AIDS Service agencies that provide direct services, preventative education and outreach to people who are HIV positive, living with AIDS or at risk for infection. Founded in 1984, DIFFA has granted more than $41 million to hundreds of community-based organizations nationwide. For more information visit diffachicago.org. Presented by Leopardo, Art For Life Chicago joins the popular series of Art For Life events around the U.S., U.K. and Canada who use art to improve the lives of individuals affected by serious illness (most notably Russell Simmons’ Art For Life in the Hamptons, and Art For Life LA honoring Tina Knowles Larson and Shepard Fairey).